January | 2013 | Don't Worry. 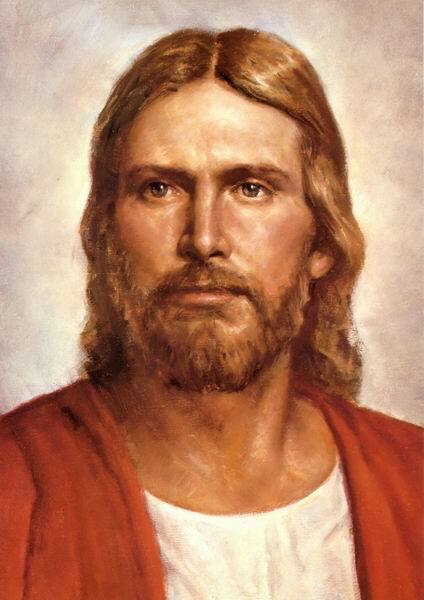 100 Days Have Come and Gone! For a few weeks leading up to the 100th day of school, I had planned on having Megan wear her 100 day shirt we made last year. I wasn’t feeling super motivated to do another shirt, and I didn’t feel like there was the same excitement for the 100 days in first grade as there had been in Kinder. So the night before the 100th day of school, I pulled out Megan’s shirt from last year and said something like, “you get to wear this tomorrow for the 100th day!! !” To which Megan replied, “No. We need a new one.” After some discussion, I realized it was important to her, and not that big of a deal for me, so I made her a new one. I didn’t go too much out of my way; didn’t buy a new shirt, and just used things we already had to make it. In the end, she loved it, and it was a big hit with her classmates and teachers. Megan (and Janie) on the 100th day of first grade. The average school year is 180 days, so the 100th day means that we are well past halfway done. We are totally looking forward to Summer around here. Nearly daily Megan talks about going swimming and how much she misses Summer. Me too, baby! 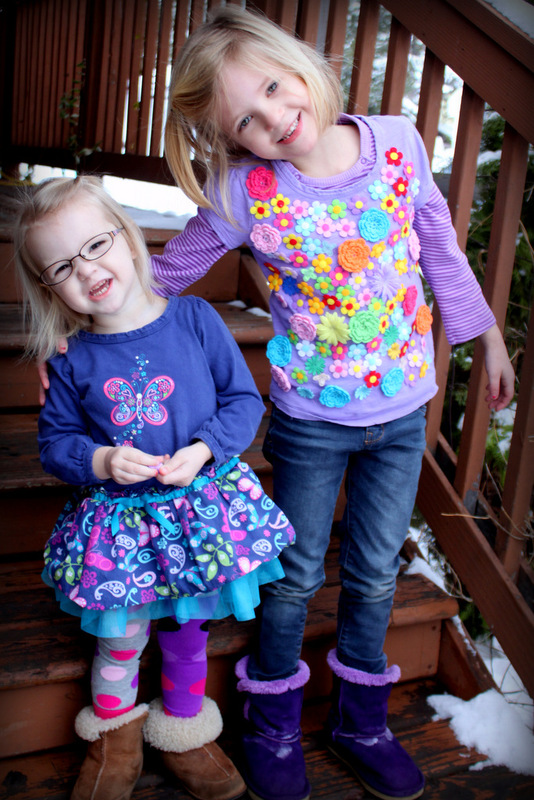 On January 11th, Jane and Megan were both scheduled for well check-ups at the pediatrician. Jane’s was for her two-year birthday, and Megan’s was because her doctor likes to see her about every six months to check her weight gain and growth. I almost called to reschedule the appointments because we got some serious heavy snow that day and their pediatrician is about 20 minutes away. But I decided to stick with it and get it done. 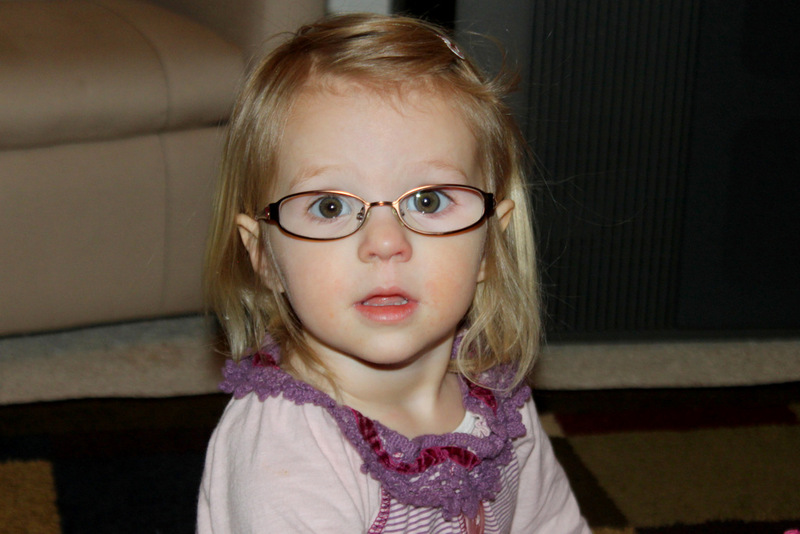 Megan weighed in at 41 pounds (17th percentile) and stood at 44 inches tall (also 17th %tile.) The doctor was pleased with her growth and she passed through the entire exam with flying colors. It’s worth noting that her BMI was in the 31st %tile, whereas at her 6th birthday she was below the 2nd percentile for body mass index. Jane fell asleep on the way to the visit, and was totally out as I undressed her for her check-up. When she did awake, she was in a great mood and was eager to follow her sister in the examination process. She weighed in at 24 pounds (24th percentile) and measured 35 inches tall ( 87th %tile.) During the eye exam part of the visit, I noticed right away that the doctor was being very quiet and was taking longer than usual. He had been examining her for a while when he turned out the lights and continued to look at her eyes. He then told me that he saw a slight abnormality with her red reflex. He said it could be indicative of a few things, one of them being a tumor. He told me that I needed to get her checked immediately by an ophthamologist. He then continued with the exam. At the end, he again turned off the lights and even shut the blinds and then looked into her eyes again. He again said I needed to get her checked right away and referred me to a local eye doctor. I called the ophthalmologist as soon as I got in the car, and the earliest they could get us in was 4 days later. To say that the next four days were emotional is an understatement. Adam and I read so much information about red reflex abnormalities and were straight scared about the prospect. I have a cousin who lost his eye at the age of 2 to retinoblastoma (which is cancer in the eye) and I was terrified Jane had the same thing. We went through hundreds of pictures of her looking specifically at her eyes, and we did indeed find a handful of photos that proved that something was going on with her eyes. I wrote a long detailed account of this all in my personal journal, so I’ll just jump to the appointment. We didn’t know what to expect, but the appointment was quite long and there was a lot of waiting. When the doctor did the final examination, it was obvious that he was spending a lot more time examining her left eye than her right. 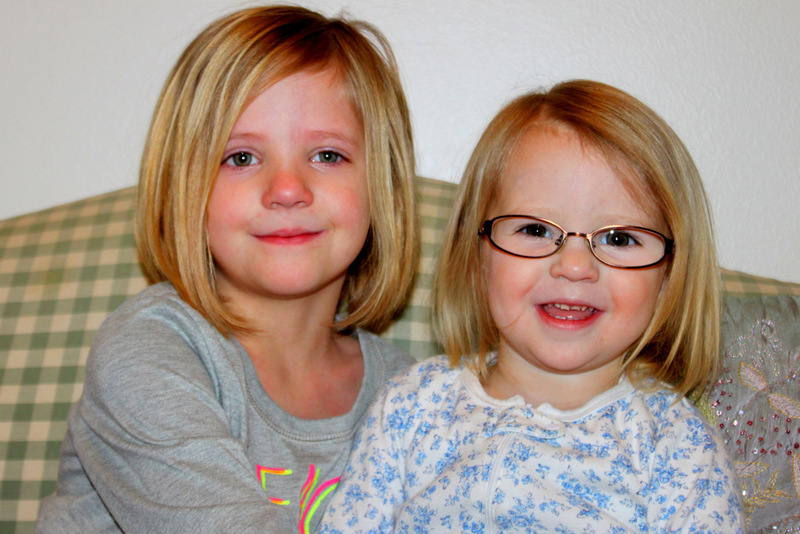 When he was finished he told us that she needed glasses and that she was incredibly far-sighted in her left eye. It made sense that the difference in the two eyes was causing an abnormal red reflex. He said that our doctor made an incredibly good catch when he referred us. He said that she likely wasn’t using the eye at all, and over time, if untreated, it would start to wander and go lazy. He said she needed glasses immediately and she had to wear them all.the.time “non-negatioable.” He said we will also need to eventually patch her good eye so she starts using the weak one more. 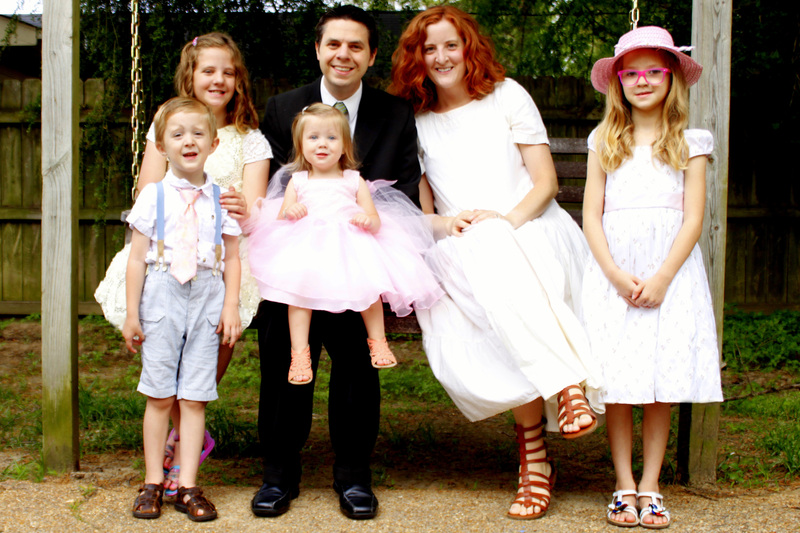 To say that we were relieved was an understatement of epic proportion, but we were also over-whelmed and felt so bad for our little girl and her weak eye. I felt so guilty that she had been walking around not using that eye for who-knows-how-long. 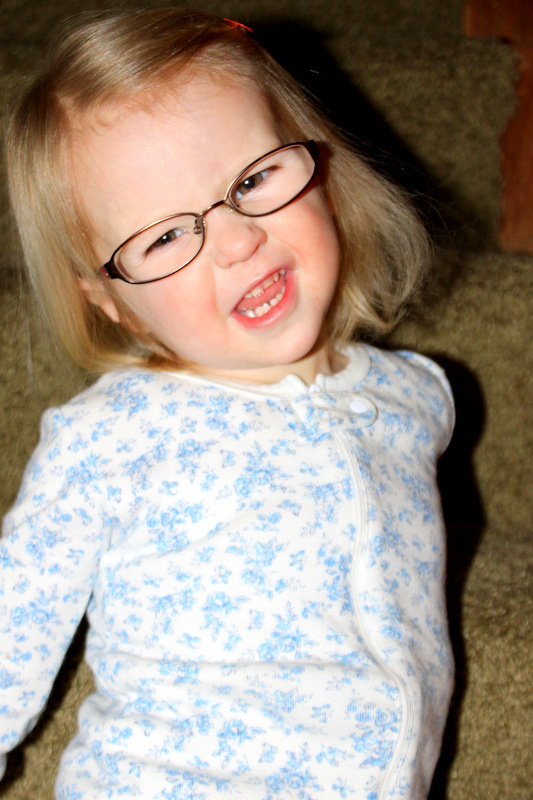 It’s been hard having a two-year old in glasses. I feel so sad that she needs them, and I can’t even ask her how they feel or if it’s making a difference. 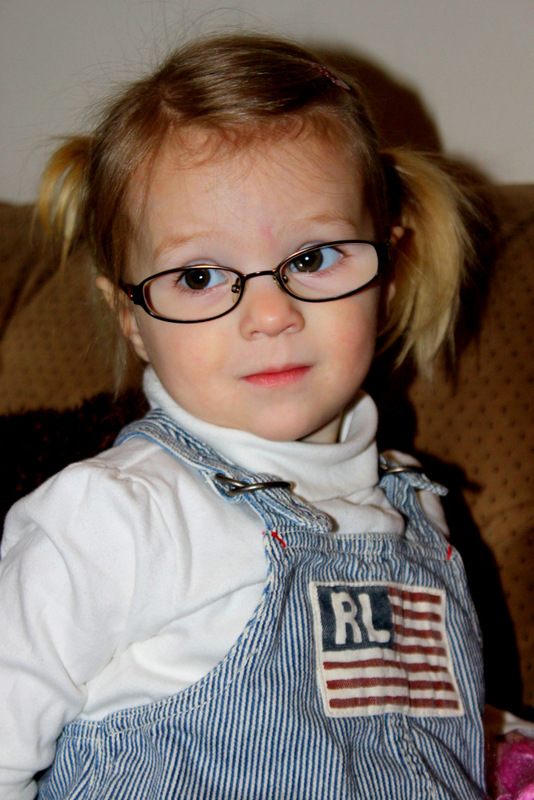 We THINK that it is, because she never tries to take them off, and seems to really enjoy wearing them (the prescription for that left eye is SUPER STRONG.) She also rubs her left eye a lot whenever we take the glasses off for bedtime or bathing, so we think she is beginning to use the eye more and see just how fuzzy her vision is without glasses. 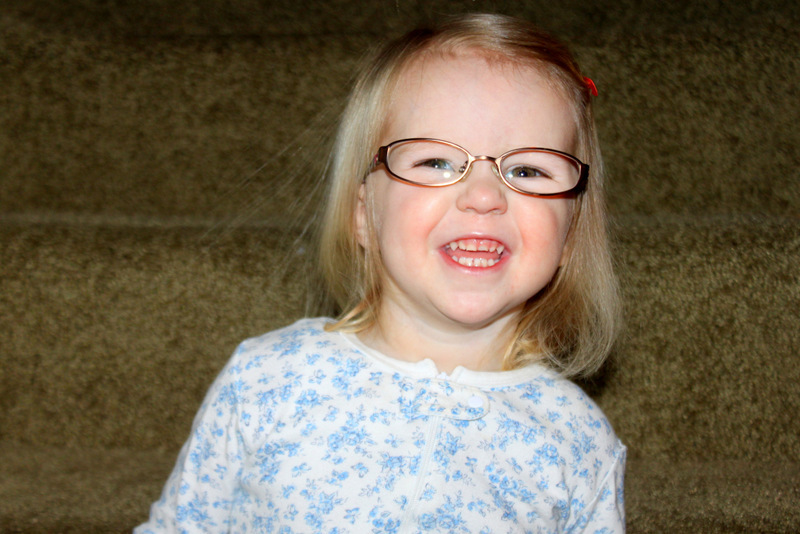 We are so grateful that it wasn’t anything more serious with her eye and I know there are much worse things than needing glasses. She sure is adorable in her glasses. That’s for sure. She has had just the best attitude about the entire process. It’s been such a blessing. 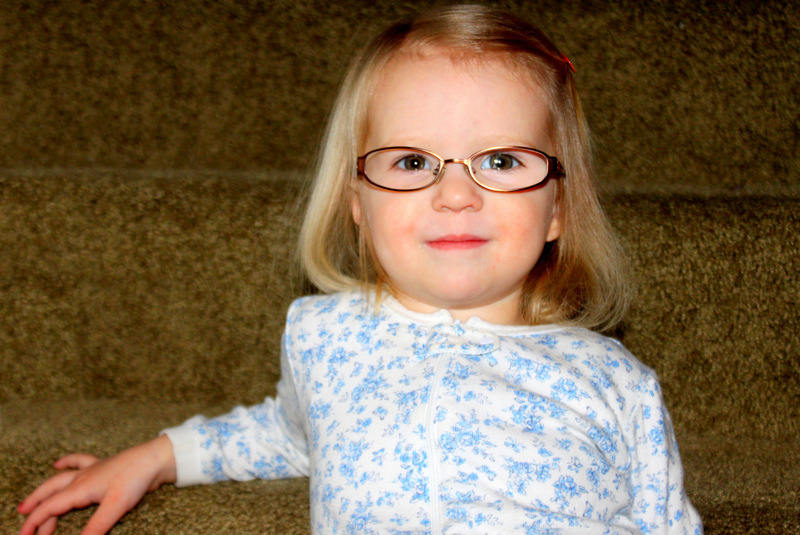 Here are some pictures of Janie in her new specs. Megan has also been super supportive and always talks about how cute Jane is in glasses. I recently ordered Jane a second pair of glasses. A back-up pair is definitely a necessity in case pair one goes missing or breaks. At this point, she definitely can not be without them for any amount of time. I got her some cute trendy purple ones as a second pair, which should also give some fun variety. I know that I have shared before that I felt so strongly impressed when Jack was born with so many physically ailments, that he knew what he was signing up for with his body and he came anyway. I have such a strong testimony of the value of our physical bodies. I don’t know why I keep getting reminders of this with my children!!! I get it!!! I think what it really is, is that these little children want to come down so badly, that they really DON’T CARE what abnormalities or struggles they have to face with their physical bodies: they are that valuable and important. I need to remember that every time I complain of minor aches and pains. Are bodies are miracles. And blessings. And wonderful!! !